Last week, fans got their first official glimpse at the wookie Chewbacca in a set video from Star Wars: The Force Awakens. However, we have yet to see any of the other original Star Wars characters in action, such as Luke Skywalker (Mark Hamill), Han Solo (Harrison Ford) and Princess Leia (Carrie Fisher). Following Sith concept art that surfaced yesterday, MarketSaw has debuted two more pieces of concept art, showcasing Harrison Ford's Han Solo and his wookie companion, Chewbacca. These images are said to be, "absolutely final iterations of concept art for Episode VII," which, if true, means that these images could closely resemble the actors themselves when we finally get to see footage or photos of Han and Chewie. The Han Solo image closely resembles concept art released back in August, so it seems likely that this is authentic. 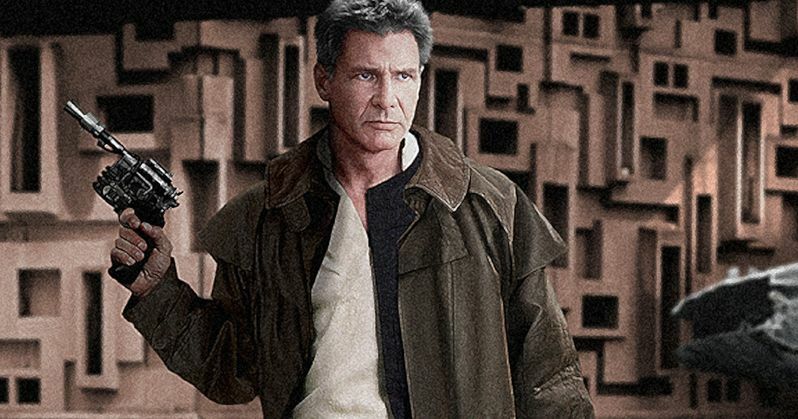 As you can see in the photos below, the white-haired Han is brandishing his blaster, wearing a full-length brown coat, but it isn't known if this will be one of the costumes Han actually wears in the film. The Chewbacca concept art, unfortunately, doesn't clear up recent rumors that the wookie may have a bionic arm, but we didn't see any evidence of that in the first prototype toy photos that debuted yesterday. It's been long rumored that Star Wars: The Force Awakens' new heroes, Finn (John Boyega) and Rey (Daisy Ridley), cross paths with Han and Chewbacca after finding a light saber that reportedly belongs to Luke Skywalker himself, sending all four on a journey to find the Jedi warrior. Naturally, these plot details were never confirmed by Disney, but hopefully we'll get a better sense of what the story is all about when the second trailer debuts. In the meantime, take a look at the concept art photos below, and check out the full images right here.